Ready or Not! The Holidays are Here! Whether you’re just getting the lights untangled from last year or if you’ve had every decoration in place since Thanksgiving, the holidays are upon us! The build-up to this most festive season is coming to a head this weekend as shoppers scurry for last-minute deals, kids celebrate the start of vacation, and travelers head over the river and through the woods. 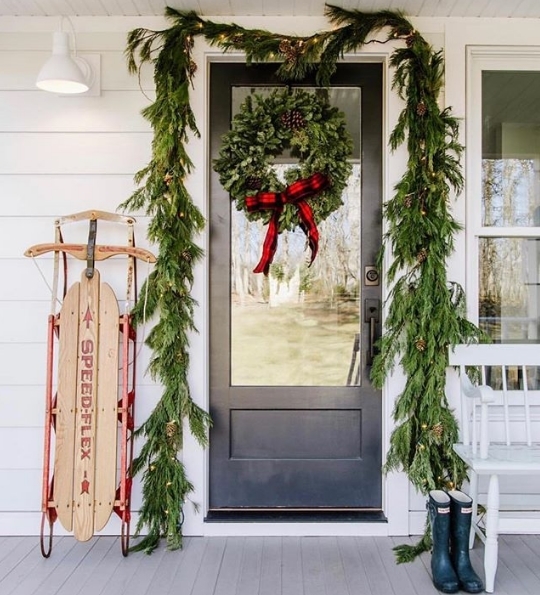 We’ve enjoyed watching everyone’s holiday decor take shape as photos from all parts of the country flood our Instagram feed. 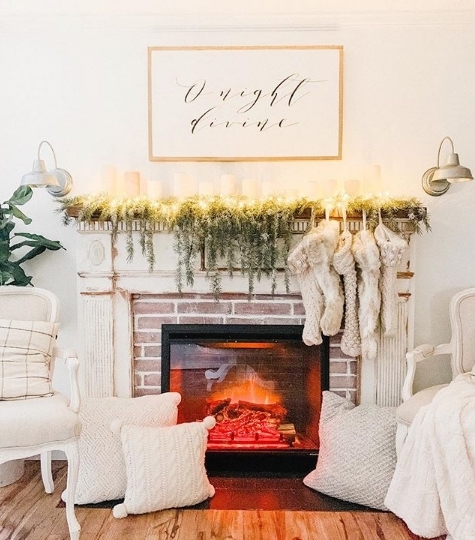 We’re sharing some of our favorite spaces today on the blog to get you in the spirit and offer some inspiration if you’ve waited until the last minute! This photo just hit Insta yesterday and we couldn’t be more thrilled with how our Chicago Vintage Industrial Gooseneck Lights look on Cindi’s barn! 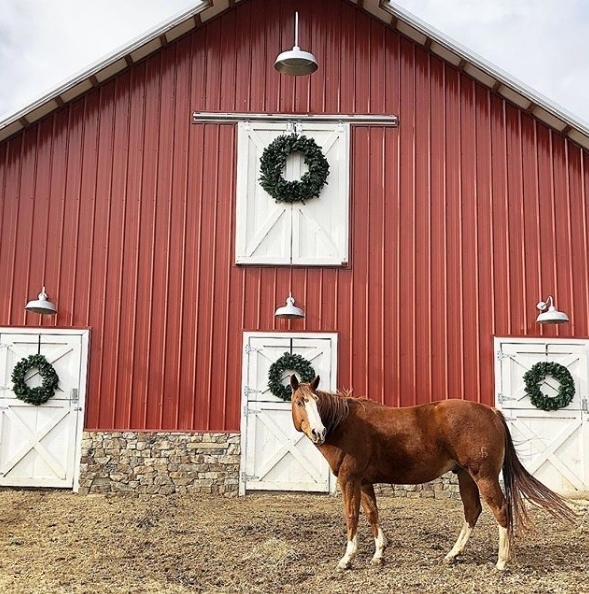 Cindi, who writes the blog Ivory Home Design from her home in Mississippi, chose these classic gooseneck lights with generous 20″shades for the barn. These hand-spun lights feature a Metallic Chrome finish, G24 gooseneck arms and heavy-duty cast guards. Cindi added a dusk-to-dawn photocell to these so she never has to worry about turning lights on or off! 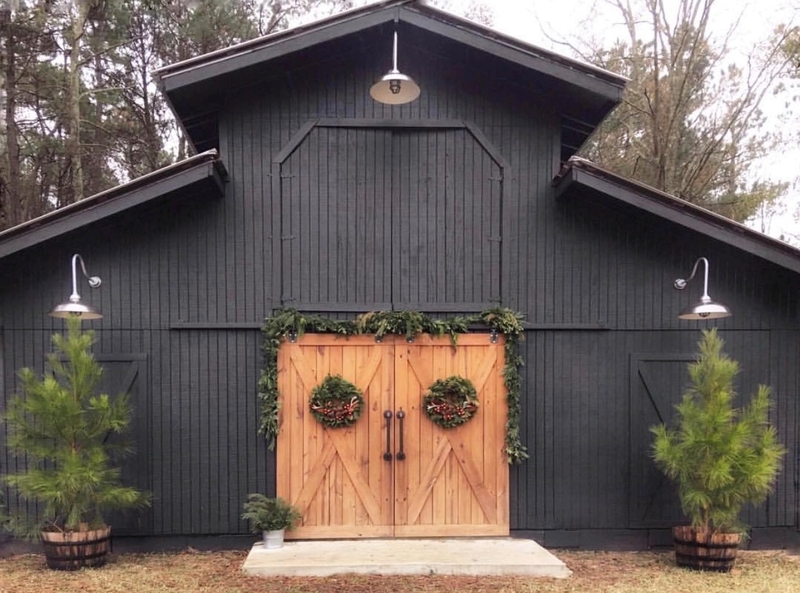 Right next door in Alabama, the animals at Our Feathered Farmhouse are enjoying their beautiful digs brightened with simple wreaths and galvanized Original™ Warehouse Gooseneck Lights. Anne Marie, from Choux Designs, created this inviting entryway with a bountiful swag of greenery and a Bantam Wesco Sconce to flank the door. You can read more about Anne Marie’s Northern Virginia home in this blog post. 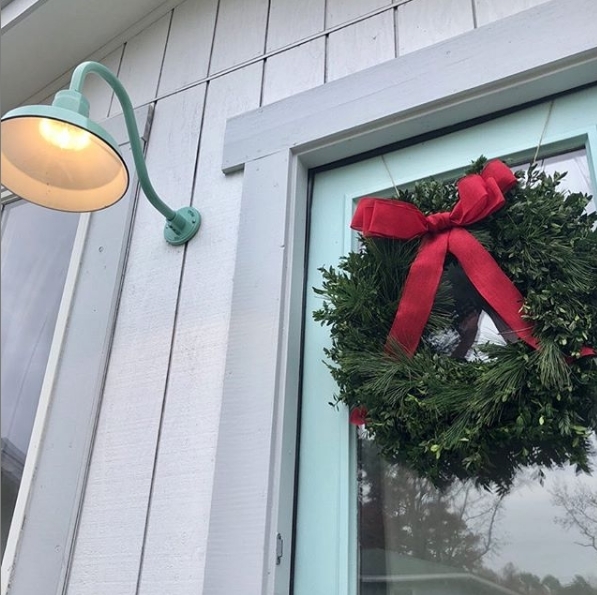 Even a simple wreath on the door of the Outer Banks Candle Company adds a festive touch! That’s our American-made Goodrich® Sky Chief Porcelain Gooseneck Light adding its own special style. Over in the Carolinas at Three.Sisters.Farmhouse, it’s all about the lights! 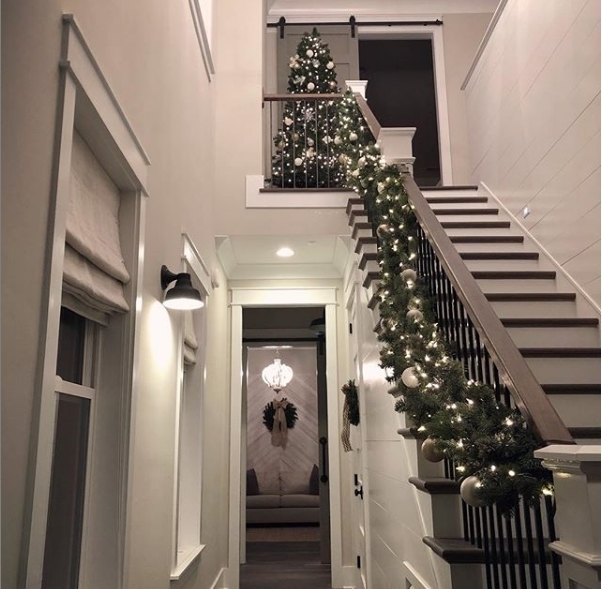 This entryway and staircase will get even the Grinch in the spirit! Our compact Bowie Wall Sconce is a perfect choice for hallways, powder rooms, and other tight spaces. Doesn’t Lauren’s space make you want to curl up with a cup of hot cocoa and wait for Santa? We love the creamy textures accented with greenery and two galvanized Austin Wall Sconces. And right back here in Florida, Meghan and her family at Uffelmanhomestead have their coastal farmhouse all decked out and ready! 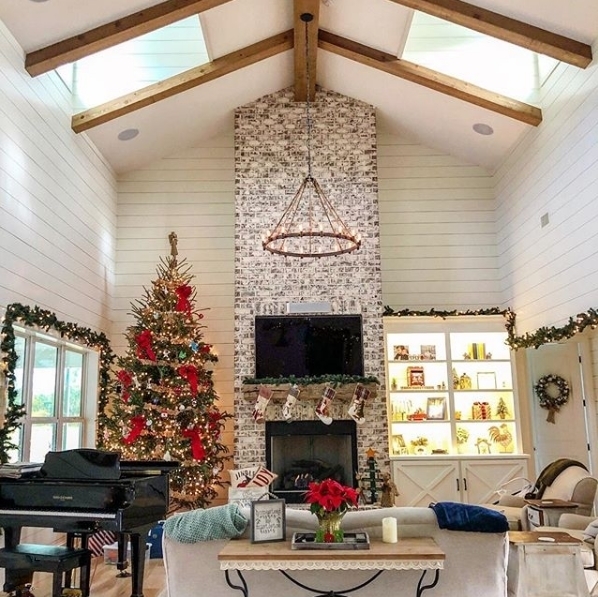 This stunning living space, with shiplap, whitewash brick, and cedar beams, is highlighted by the rustic Outer Banks Chandelier. Be sure to check out this post where we featured the history behind Meghan’s home.